Are you a keyboardist who is looking for an affordable selection of keyboard gear? You've arrived at the right place. At N Stuff Music our used department contains a selection that is more vast than any other music store in the region. But what really makes N Stuff Music unique is our tireless commitment to satisfying customer value. At N Stuff Music you can be sure you will get a great deal on all used keyboard gear that you are interested in. Whether its keyboards, keyboard amps, monitors, synthesizers, or any type of keyboard accessory, you can find a selection of them available in our used department. Our used department, run by our very own Steve Jackson, is one of the most formidable in entire region. N Stuff Music doesn't run our used department like other stores. Many other stores when a piece of potential used gear comes in, whether it is on consignment or trade-in, it is hardly ever tested and instead many stores simply slap a price sticker on it to try and quickly turn it around to the next customer. But at N Stuff Music when a piece of potential used gear comes into our store it is thoroughly tested to be sure that it will be fully usable and of full capability upon being resold to future customers. We have a quality selection and variety of used keyboards and synthesizers consistently in our used department stock. Trying to channel your inner Joe Zawinul or Cory Henry but don't want to spend the full price of a brand new synthesizer? 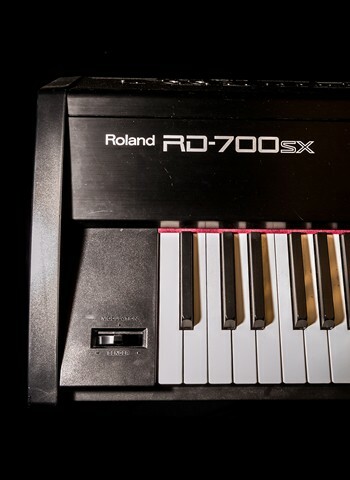 Check out our used department and you can find a terrific deal on a synthesizer and we've had brands in our used stock such as Novation, Akai, Roland, Moog, Yamaha, and many others. If you're a beginner or just looking for an affordable price on a keyboard whether full sized or smaller you can consistently find them available in our used department. We have very affordable used pricing on keyboards ranging from full 88-key boards all the way down to student models and have had all of the major brands in our used inventory at some point including Nord, Yamaha, Roland, and many others. For customer trying to find an affordable price on a keyboard amp or monitor you can surely find something in our used department to fit your needs. Many keyboardists vary on if they prefer a keyboard-specific amplifier or a PA monitor or speaker but lucky for you, we consistently try to carry both in our used department. There is no better place to shop for quality and high value used products than at N Stuff Music. Our products are fully tested to be sure they are of great working condition before we agree to let them into our used department. We take the time and care necessary to ensure that we are providing customer value to everyone who stops in our store. Thanks for visiting us at N Stuff Music!